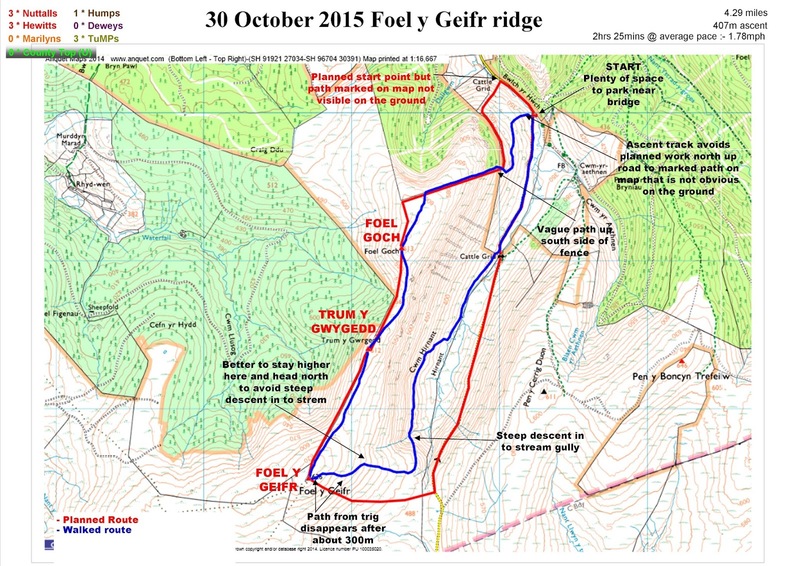 Walk start at base of Foel y Ddinas. Overnight rain continuing well in to the morning delayed my first expedition above 2000', for six months since April 2013, until early afternoon. A persistent and reoccurring back problem was the reason for the enforced sabbatical and why this first foray above 609.6m, was just a 'straight forward' circular walk 4½ miles from the valley road up on to the ridge and along 3 summits then down and back along the valley floor and return to van and walk start point. 'Straight forward' obviously a subjective and relative term but the late start not a problem even with the earlier sunset as a result of clocks going back the weekend before. Due entirely to prolonged rehab and gradual reintroduction to walking starting with short strolls along Iberian beaches in September, progressing to short hill walks early October interspersed with incremental increases in distance and ascent over the past month. All in all a total of 22 walks covering exactly 50 miles and nearly 3500' of ascent, visiting 20 of the 23 Area 38: Welsh Borders Marilyns. Amongst these were a 7 mile route and a couple of 5 mile routes so working out the average of the rest comes to less than 2 miles per walk. Pretty mundane stuff but necessary to build up basic fitness and core strength to attempt what in the past would have been an easy walk. Apparently patience is a virtue. Turns out it was a straight forward walk but a reminder that we should not take health for granted even though I seem to repeatedly do; just that. Failure to see the marked footpath near cattle grid in Bwlch yr Hŵch during drive to walk start resulted in finding a far more suitable start point with what seemed an obvious track to begin the ascent up Foel Goch. As often seems to be the case the path fizzled out leaving me to find my own ascent route up to the fence boundary south of wood at north end of target ridge. Can't comment if my route to fence was the best but did seem to find the best point to get over fence at woods SE fence junction. Not only was there a strong post but a reasonably well worn path and ascent route on the other side to the south of the fence. After 10 minutes of heavy breathing and what seemed a stiff climb I reached the ridge which opened up views to the right and north along Cwm Hirnant and the approach road to the start point. The scenery during the drive was good enough, but the view down from the top reminds me of one of the reasons why I walk the hills. To the south and left was a shallower rate of ascent to Foel Goch but also no path though calf deep heather. I did eventually find a path but no evidence to suggest I could have avoided the romp through the heather if I had continued further along the fence. Continuing along this path brings you to the first summit of the day, Foel Goch and sight of a small cairn ahead and to the right. It does not actually mark the high point. You will most likely be already standing on the highpoint near the path as you first see the cairn. From the summit looking south, cloud permitting, you will see the remaining two summits, Trum y Gwrgedd and Foel y Geifr. I could also see the path continuing and the fence line to aim for that takes you all the way to Trum y Gwrgedd summit. The path did disappear into heather on the descent from Foel Goch but reappeared as I picked up the fence line near the 567m spot height. Trum y Gwrgedd summit is just on the other side of the fence being indicated by a couple of pieces of wood laying against the fence. A quick hop over the fence satisfies the urge to actually stand on the summit that can just as easily be photographed from this side of the fence, but then would not count as a true bag. After photos of heather time to continue along the fence for the descent and ascent up the highest Nuttall of the day, Foel y Geifr. The summit area has the bonus of being marked by a trig point and comes in to view just about at the point were the route departs from the fence line. Very handy to remember if visibility is restricted. Following summit rituals all that remains is to return safely to the van. A path does continue south which I presume would turn left towards the road and bwlch near Foel y Garnedd, but there was also a less pronounced path from the trig to the east which I thought would be more direct. It was more direct but possibly not as straight forward. I opted to descend further than perhaps I should which resulted in an unnecessary crossing of a fairly fast flowing stream in a steep gully. Maybe I should have stayed higher passing the stream just above its head. There were many tracks heading diagonally down Cwm Hirnant to the valley floor one of which I did pick up taking me to a gate and planned start point at cattle grid due east of Foel Goch summit. From here it is a 15 minute walk along the road back to the van and walks end.